And key to all this is that all these 4 revolve around having a dynamic training plan. The morning recovery test effects all other aspects of the daily cycle, the simple fact is that if you are not recovered sufficiently from your previous workout, work or other life stress then you are not going to be training effectively. Yes, there are times when you want to be a little tired or stressed, for example if you are overreaching to obtain a peak, but most of the time you want to be fresh to obtain the most from stressing your body again from training. That’s what it’s all about at the end of the day – stressing your body so it will adapt then recover stronger and fitter than before. To test my recovery I have chosen to use ithlete Pro. A simple mobile phone app that monitors you morning heart rate for 1 minute and gives you detailed and precise advice on the recovery status at that time. So what if you are not over-reaching but ithlete has advised to either rest or take things easy today but you still have a harder workout planned? This is where your training plan must be dynamic – characterized by constant change. If ithlete indicates a rest then that’s what you do, this may mean missing a session from your plan, if ithlete says a light workout is prescribed then adjust your training to suit, maybe aerobic and not that anaerobic intervals that has been planned. The ithlete training guide gives you exact advice. Now recovery status has been established, next is to decide on a nutritional plan. This can be affected by many things but mainly by the dynamic training plan, the type of workout planned and the goal that the workout is to achieve. Different nutritional strategies can change the training effect of the workout, so this can be just as important as planning the actual training itself, all of which should already be considered when your training plan is compiled or agreed with your coach. The dynamic element also comes into play even when training, if you are not feeling it then it may be time to take things easy too. Training can be tough, day after day coupled with life stress and mentally you may be tired. I also like to use the recovery function on my Garmin 520 that assess your ability to train in the first 15 minutes while training. On the flip side if you are feeling good then this confirms that your recovery strategy is working great. 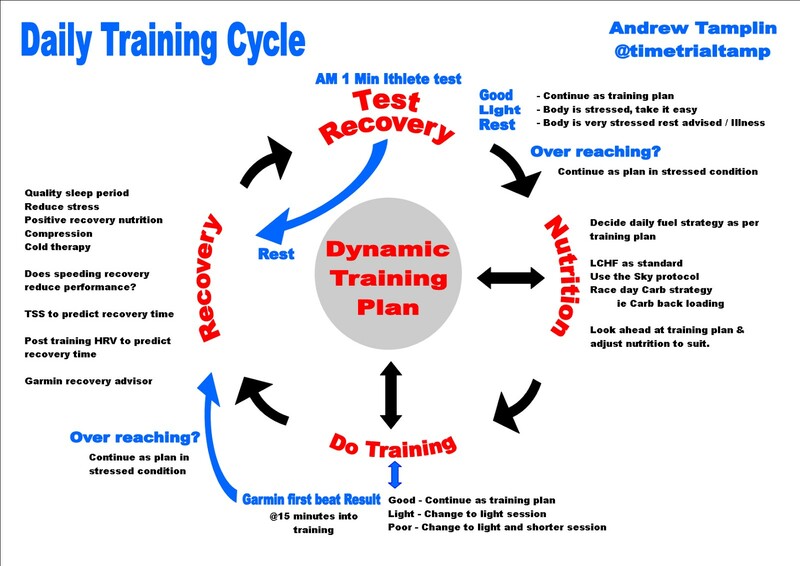 After training has been completed then focus turns to recovery, is there need to recover faster? Would increasing time to full recovery by forcing your body to do so reduce future performance or is it best to allow your body to recovery in its own time naturally? 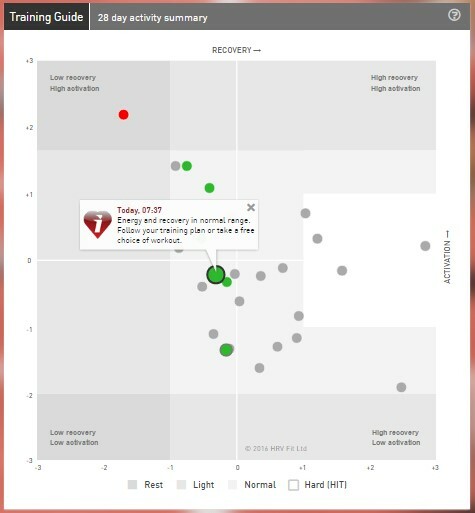 I believe there are merits in both, forcing quick recovery may be required in certain situations but a more lengthy natural recovery linked with good post training nutrition, I believe, is better and for me personally it’s a better option – of course linked to continued monitoring using ithlete for peak performance. But my favourite but also a little more geeky way to assess training stress is to do another ithlete reading after training and see how the stress of training has affected the result. I am still learning everyday how my body reacts to training but ithlete is a great tool in my armoury. Editors comment: Andrew is experimenting with a technique we previously blogged about in this article Can HRV be used as a more accurate, individualized measure of training load? I hope my daily training cycles goes some way in helping you stay focused, achieving your goals whatever they maybe.